A gentle formula blended specially for sensitive acne prone skin, Elixir Shop Toning Elixir is enriched with witch hazel, rose water, lavender water, chamomile and geranium water, and essential oils. It has natural clarifying, firming, anti-acne, hydrating, and soothing properties. It also gently balances the skin, reducing oil production in oily skin and hydrating dry skin, giving you a healthy skin tone and clear skin. What else you need to know: Toning is the best way to ensure that there are no impurities left on the face and the easiest way to hydrate and balance the skin. It is very important to tone your skin after washing it and using a natural toner is better for your skin. 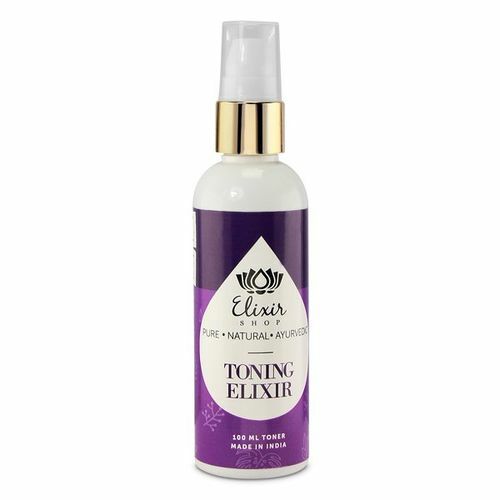 Our Toning Elixir has been blended with witch hazel, which is a natural astringent with antioxidant properties. It is one of the best ingredients to add to any skincare product as it helps kill bacteria, heals the skin faster, reduces signs of ageing, reduces cellular damage, and soothes the skin. Along with witch hazel, the product has rose water, lavender water, geranium water and chamomile water, all of which have amazing skin care properties.